FILE - A health worker prepares an Ebola vaccine to administer to health workers during a vaccination campaign in Mbandaka, Congo, May 21, 2018. The World Health Organization (WHO) says it is cautiously optimistic about containing the spread of the Ebola virus in Democratic Republic of Congo, but warns that much work lies ahead. Thirty eight of 62 suspected cases have been confirmed. Of this total number of confirmed cases, 27 people have died. The World Health Organization reports the majority of confirmed Ebola cases were detected two to three weeks ago. Since then, there only have been a few sporadic cases.It notes there have been no confirmed cases since mid-May in two of the three affected areas in DR Congo, the large city of Mbandaka and Bikoro, where the virus was originally detected one month ago. 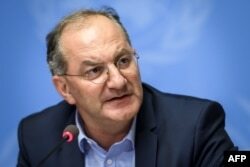 FILE - Head of the World Health Organization (WHO) Health Emergencies Programme Peter Salama attends a press conference following an International Health Regulations Emergency Committee on an Ebola outbreak in Democratic Republic of Congo on May 18, 2018 at the United Nations Offices in Geneva. Peter Salama, the WHO's deputy director general of emergency preparedness and response, said the fact that there have been no recent confirmed cases is important. He said nearly 700 people who were in contact with infected individuals have been immunized with a promising, experimental vaccine. "We have added cause for optimism because now we have reached for the majority of the contacts — more than 98 percent of the contacts — with vaccination," he said. "And because the vaccination for the majority of them occurred 10 days ago, we believe that the majority of those contacts in the ring vaccination are now protected against Ebola. So that gives us a lot of source of optimism along with the fact that we have not seen cases since mid-May in those two locations." Salama said phase one to protect urban centers and towns has gone well and the WHO will now begin phase two. He said the focus will be on vaccinating health workers and contacts of infected persons in the third affected area of Iboko and the tiny town of Itipo within this health zone. A case of Ebola was confirmed there on Thursday. Iboko is a very remote, forested region with a large, marginalized indigenous population. The town of Itipo has no infrastructure, power or running water. Salama said the logistical challenges of identifying, tracing and then vaccinating every contact of an infected person in this area are enormous and the work ahead over the coming weeks will be very tough. An Ebola outbreak in West Africa a few years ago left more than 11,000 people dead.